Take a classic winter vegetable stew; add some surprises and you have a terrific comfort food for those chilly evenings! How did we come up with Three-Green Soup? 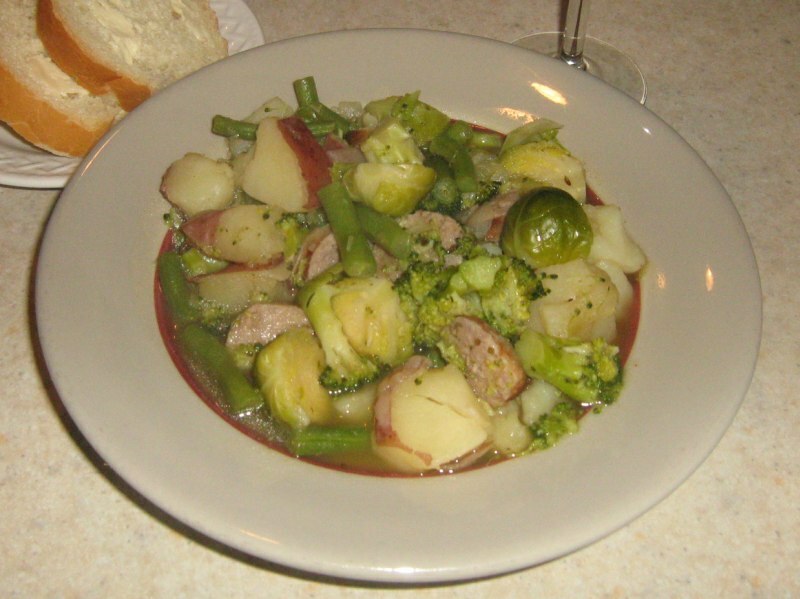 Challenged by one of our readers to create a dish that would incorporate four of her favorite foods in one dish (potatoes, brussels sprouts, broccoli and green beans), we decided that the combination was probably right for a soup or a baked casserole. We opted for the soup and turned a classic winter vegetable stew into a three-green soup that is tasty and reasonably quick. This is a great soup with an astounding 24 grams of protein and almost 19 grams of dietary fiber! So, if you like thick and chuncky soups or stews you're going to love the Three Green Soup! Let us know what you think - we always like hearing from our visitors! In a large Dutch oven or stock pot, bring 4 1/2 cups of vegetable stock to a boil. Add the carroway seeds, onions and potatoes. Reduce heat to a rolling simmer. Cover and cook for 10 minutes. In the meantime, place the green beans in a steamer. Add the dried oregano and steam until tender - about 10 minutes. Brown the sausage, cool and slice. After the potatoes have cooked for 10 minutes add the brussels sprouts and cook for another 10 minutes. Then add the broccoli florettes, the steamed green beans and oregano, and the veggie sausage. Allow to cook another 5 minutes. Test that beans are tender and adjust cooking time by a few minutes if necessary. * You might try Field Roast or Tofurkey brands.